Pruning raspberries (Rubus ideaus and Rubus occidentalis) provides room for their new stems to grow and helps prevent the spread of plant diseases. Hardy in U.S. Department of Agriculture plant hardiness zones 4 through 9, raspberries bear yellow, black, red and purple fruits in summer and fall, depending on the variety. 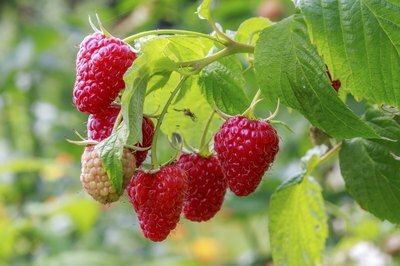 Pruning needs differ among the varieties, but all raspberries must be pruned to grow healthily and produce heavy crops of fruit. Sterilize pruning shear blades before and after pruning raspberries by wiping the blades with a cloth that was dipped in rubbing alcohol. 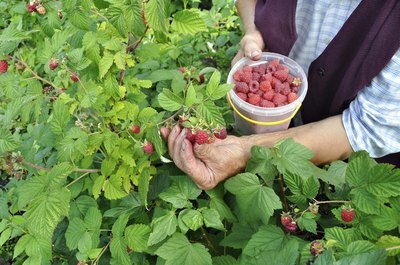 In some areas, raspberries are invasive, and pruning helps contain them. Some raspberries should be pruned after they are planted. The stems of raspberry plants are called canes. Prune all the canes on traditional raspberry transplants to 5 inches tall after planting. Black and purple raspberries are sometimes sold as tip-layered cuttings, and their canes should be pruned to ground level after planting. Don't prune root cuttings or tissue-cultured plants. 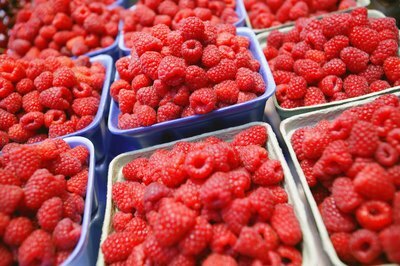 Many raspberries sold in plant nurseries and garden centers are traditional transplants and are bare, brown stems either in containers or bare-rooted in bags. Tip-layered cuttings, root cuttings and tissue-cultured plants are usually green and in leaf. 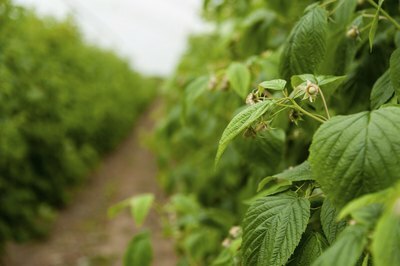 If you're unsure what kind of raspberry plant you have, ask your plant supplier. Summer-fruiting raspberries are pruned in spring and after fruiting. The cultivars "Taylor" (Rubus idaeus "Taylor"), which is hardy in U.S. Department of Agriculture plant hardiness zones 4 through 8, and "Latham" (Rubus "Latham," USDA zones 3 through 8) as well as other summer-fruiting varieties bear fruit on canes that grew the previous year. Prune thin, weak, dead and diseased summer-fruiting raspberries' canes to the soil surface in spring when daytime temperatures are about 50 degrees Fahrenheit and before new growth appears. Also remove some of each plant's canes so that its remaining canes are 6 to 8 inches apart and the row of plants is 12 to 15 inches wide. Tall canes should be shortened to 4 1/2 to 5 1/2 feet tall. In summer, prune canes that have fruited, cutting them at ground level. Fruited canes are usually thicker, darker and more woody than canes that didn't fruit. "Taylor" is invasive in some areas. Which one of the two methods you use to prune ever-bearing raspberries depends on when you want to harvest the plants' fruit. Ever-bearing raspberries produce fruit on last year's canes in summer and on this year's canes in late summer or fall. If you want a once-per-year harvest, then prune ever-bearing raspberries such as "Heritage" (Rubus idaeus "Heritage," USDA zones 4 through 8) and "Fallgold" (Rubus idaeus "Fallgold," USDA zones 5 through 8) in spring, cutting all the canes to the ground. For a twice-yearly harvest, prune thin, damaged and diseased canes in spring, and also at that time remove about 1 foot from the ends of the previous year's canes. The summer crop appears on the lower part of the canes that bore the previous year's crop. Prune those 2-year-old canes to the ground immediately after harvest. "Heritage" and "Fallgold" are invasive in some locations. Black and purple raspberries are pruned three times each year. "Bristol" (Rubus "Bristol"), "Munger" (Rubus "Munger"), both hardy in in USDA zones 4 through 8, and other black and purple raspberries are pruned to encourage sturdy, branching growth and to remove fruited canes. In spring, before their new growth appears, prune damaged and diseased black and purple raspberry canes and those thinner than 1/2 inch in diameter. Prune them at ground level, and prune the remaining canes to make them 2 1/2 to 3 feet tall. Prune the branches on black raspberry canes to 8 to 10 inches long, and the branches on purple raspberry canes to 12 to 14 inches long. Raspberries can grow standing on their own or supported on frames and trellises. In summer, prune freestanding black and purple raspberries regularly so that black raspberries don't grow taller than 3 feet and purple raspberries don't grow taller than 3 1/2 feet. Prune supported black and purple raspberries when they grow 6 to 12 inches taller than those measurements. Remove the top 2 to 3 inches of each cane when you prune. Prune fruited black and purple raspberry canes at ground level after harvesting their fruit. Missouri Botanical Garden: Rubus "Latham"
Missouri Botanical Garden: Rubus Idaeus "Fallgold"
Missouri Botanical Garden: Rubus "Munger"
Missouri Botanical Garden: Rubus "Bristol"